Figure 1. By now, the waters above the heavens (Psalm 148:4) are probably a thin veil of ice particles, or scattered planet-sized spheres of water covered with thick crusts of ice. Unless you have attended one of Russ Humphreys’ seminars in the last few months, or else read the Journal of Creation cover to cover, you probably missed the birth of a new creation cosmology in the December 2008 issue. Quietly tucked into the back pages of an article by Dr. Humphreys on general relativity is a new answer to the light-transit-time problem—to explain how light traveled from the distant cosmos and reached Earth, all during one ordinary-length day on Earth, the fourth day of creation. Humphreys used an equation he derived in the August 2007 issue, a new solution to Einstein’s gravity equations. 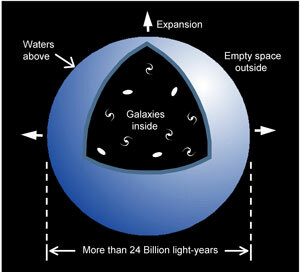 The new solution accounts for the effect of the “waters that are above the heavens” mentioned in Psalm 148:4 (Figure 1), and the effect of God’s creating the material of the stars during the fourth day (Isaiah 40:26). When the sphere reaches zero radius and disappears, Earth emerges, and immediately the light that has been following the sphere will reach Earth, even light that started billions of light-years away. An observer on the night side of the earth would see a black sky one instant, and a sky filled with stars the next instant. This new cosmology springs from the same root as his 1994 cosmology in Starlight and Time, namely a cosmos with a center of mass, the earth near it (on a cosmological scale of distances), and expansion of space. (Dr John Hartnett has two creation cosmologies that have these features as well.) However, Dr Humphreys likes his new model better than his old one, saying it is clearer and simpler. 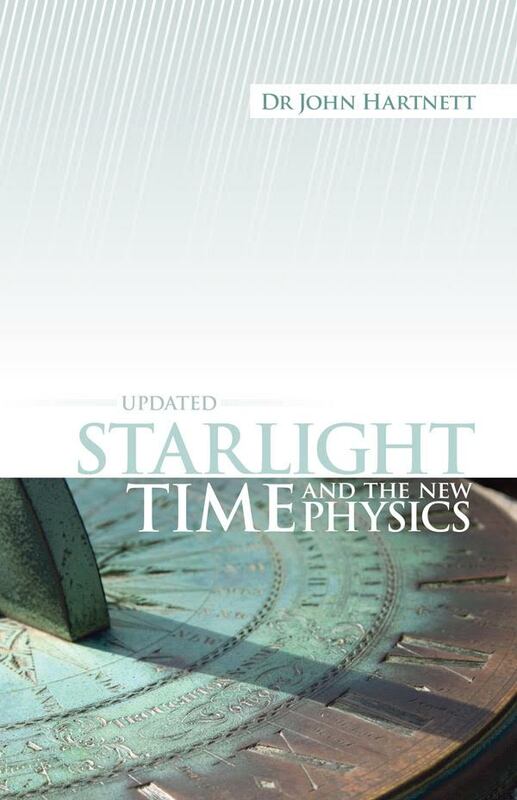 Dr Hartnett agrees with that, saying that it solves the problem of time dilation for stars that are relatively near. We’ve decided to make Humphreys’ 2008 Journal of Creation article available earlier than normal, here on the CMI website. He hopes to submit an article to the website soon explaining the new cosmology in simple terms—no equations or graphs, but possibly some animated graphics. Warning: it will be understandable, but mind-stretching!